A Florida principal has been suspended without pay for two weeks after he posted Facebook comments calling gay people “sick” and quoting a Bible verse saying that “must be put to death,” The Advocate reports. School principal Steve Kenney posted a Bible verse calling for gays to be put to death in response to a photo of two men kissing. Steve Kenney, who is the principal at Center Academy in Pinellas Park, Florida, about 100 miles from Orlando, posted the comments just 36 hours after the shooting at an Orlando gay night club that killed 49 people and wounded 52 others. The school serves children with dyslexia, autism spectrum, and attention deficit disorders. 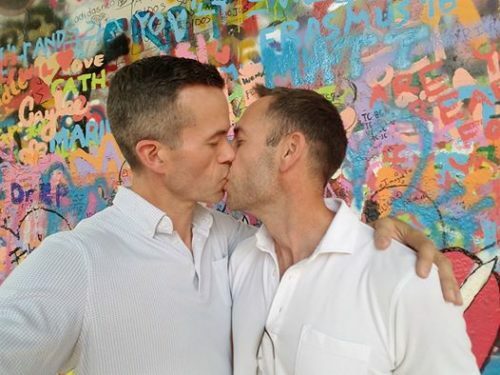 The comments were in response to a photo of Outsports founder Cyd Zeigler kissing his partner of 13 years. Zeigler said he is not directly connected to the principal and suspects the photo was shared by a mutual Facebook friend. “I wondered how an educator of young minds — a school principal — could not only think such terrible things about gay people, but go a step further and post them on a stranger’s loving photo only hours after the massacre,” Zeigler wrote. We do not condone nor agree with the views or values reflected in the recent personal Facebook statements posted by an employee of our school in mid-June. On behalf of Center Academy, we extend our sincere apologies to anyone who was hurt or offended by them. As we shared with the writer from Outsports, the statements are a serious violation of our school’s Code of Ethics and non-discrimination and social media policies. The employee was suspended without pay for 2 weeks, will be attending mandatory diversity training and professional counselling, and has permanently removed the post from his personal Facebook account. Further, in making every effort to ensure this situation does not occur again with any employee of our school, we will conduct mandatory, school-wide diversity training this August (and annually moving forward) at each of our campuses. This is in addition to our yearly Code of Ethics and non-discrimination and social media policy reviews and updates held each August before school begins. GLSEN Executive Director Eliza Byard told Zeigler its important to call out this type of bigotry among education professionals.